Assumption Parish Waterworks District N0. 1 will be combining our two billing cycles into one. Therefore, starting February 2018, all of customer bills will be due on the 20th of each month. 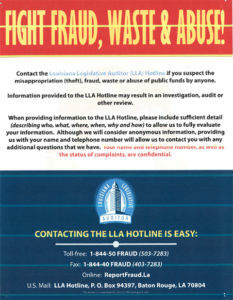 We are also updating our records and requesting your assistance, by calling us at 985-369-6156 or mailing in with your bill the following information: a good daytime telephone number, the last 4 digits of the social security number and a valid driver’s license number for the name on the waterworks account. We appreciate your patience and cooperation with us as we move forward with this transition.